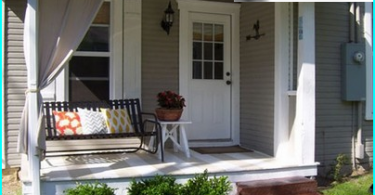 Landscaping addicted to many ownerssuburban areas. As a result of their efforts the space surrounding the cottages are not only costly, but also ordinary private houses significantly transformed. Today, the gardens and even orchards gradually hand over the position and concede their place of lawns, flowerbeds, vegetable beds and unusual compositions, adorable. 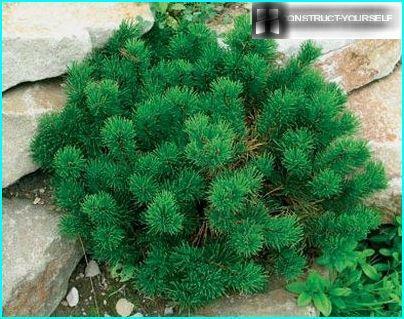 However, the flower beds are always attracted the attention of gardeners, and ornamental shrubs often decorated areas, but the conifers in landscaping if used, it is not too often. Today, they are becoming more popular. Tree and shrub composition only then will look holistically, where the distance from the point where it will be inspected more often, will be at least two of its height. The presence of a lawn as a background for conifers most preferred. 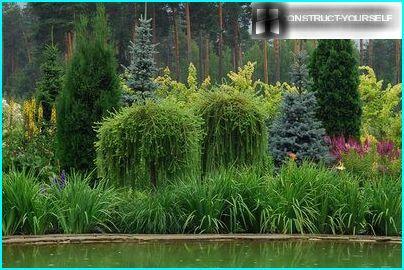 Most conifers are planted close to bodies of water that, in conjunction with weeping deciduous plants, they constituted a single original composition. 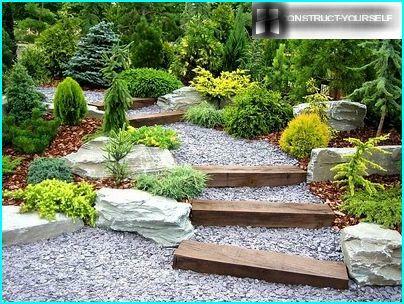 The spectacular of all, according to experts, when conifers composition in landscape garden design focused on the east or west. Listen to advice and tips to make your site become more beautiful, and the time spent on it to bring you pleasure. If the composition comprises three components, the present, only two colors can therein. Quintuple composition should consist of no more than three different colors. If the elements in the composition of 25, and even more, they need to integrate them in groups of three copies, with plants in the same group should be selected on the basis of a single color. Only in this case, conifers make an ensemble in which they will look harmoniously, without violating the integrity of the picture. Creating assemblies, it is necessary to consider not onlythe color of the plant, but its height in adulthood, as well as the shape of his crown. To predict the appearance of the composition in the future, you should be armed with the knowledge to pre-select one of those plants that can offer modern market or nursery. Western arborvitae. The plant reaches a height of 5 meters, prefer shaded areas may be subject to haircuts. Often used as a hedge. Juniperus Skyrocket. Pleasant plant conical shape, which has a soft blue needles. It grows up to 3m. Prickly spruce Hoopes. A very popular variety that is able to grow to 15m. 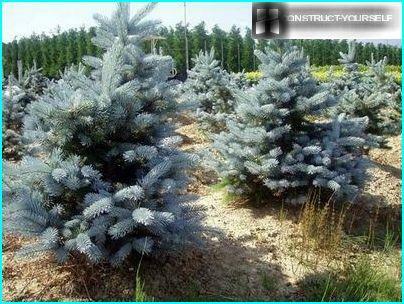 It has a thick needles silvery-blue color. The plant exhibits resistance to adverse natural factors. Pine Vatereri. It is the birthplace of the Mediterranean region, so we can say that it is particularly suited to the southern climate. 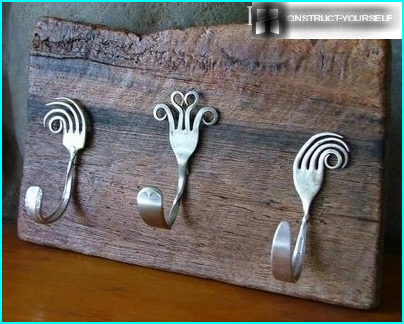 Has twisted spherical shape, it grows to a height of 4m. Pine Silvestris Pincus. This giant conifer that grows up to 40m in height. It has a straight trunk and a columnar structure. In demand due to the absolute unpretentiousness. If rapid growth up is undesirable, it is possibleadjust the size of the plant constant topping his shoots, but this should be done on a regular basis: every year. Otherwise, you can get a plant-monster. Spruce Konica. 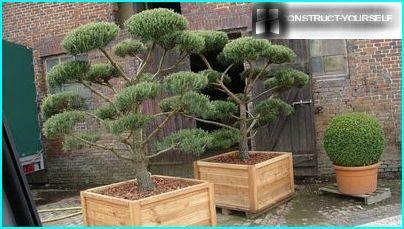 This branching and very showy evergreen tree in demand, as slowly growing and looks good. Berry yew. 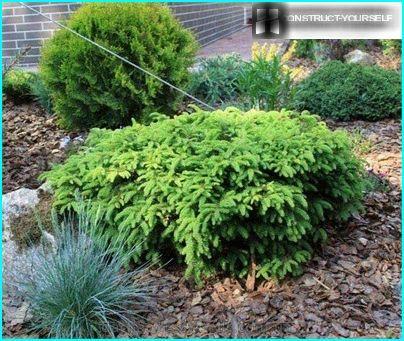 A compact shrub with thick needles on the lawn looks great and is very popular due to the combination of lush greenery and bright red berries. Western arborvitae. 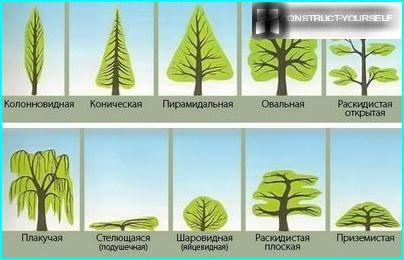 Very nice and compact ball, whose branches grow thick in the vertical direction with respect to the trunk. Golden yew. It can grow in partial shade, it feels great in the vicinity of the high and low-growing plants. 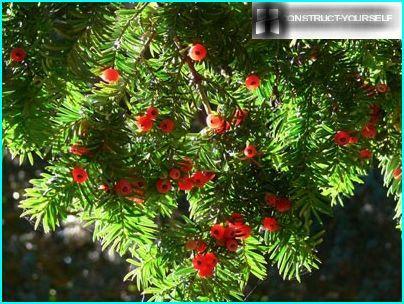 It has the shape of the cup and needles yellow-green or golden. As a rule, these plants form the basis of compositions. Fortunately complemented stunted conifers, they look great anywhere in the garden. Vyvazhivaya such a plant, it is necessary to provide sufficient space for its development. After all these conifers are growing up, and in breadth, capturing space and forming a kind of barbed lawn. Spruce Picea Lombers. Despite its name, this looks very unusually spruce. This undersized plant with dense emerald green needles. Western Thuja Tiny Tim. This plant loves light, but does not require copious irrigation. It looks like a ball, rolled out on the track. Mountain pine Hampi. The plant is ukrasheniiem rock gardens. Grow apart. Her kidney at low temperatures become decorative reddish-brown hue. Mountain pine Mini Pug. It grows in the form of fluffy pillows. Effective and pleasant to look at. 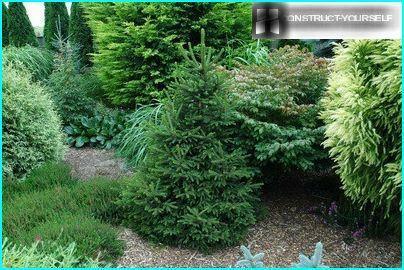 Low-growing conifers in the garden design can beparticularly attractive, if cared for properly. It is they, in combination with a medium growth, are able to create an indescribable atmosphere of a Japanese garden, its flavor. Conifers perfectly combines not onlywith each other, but also with deciduous shrubs and trees to create interesting compositions. 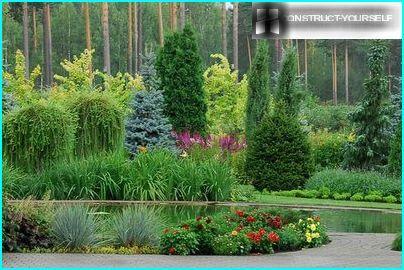 For plant combinations there are rules that need to know, forming a portion of the design. 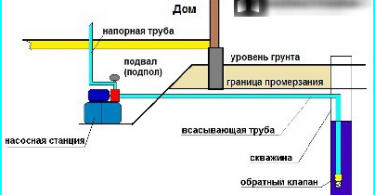 Mixborders can be positioned where inaccording to your vision of the site plan, he will be particularly relevant. It is important not to be afraid to do what you want. From the manifestation of individuality landscape designer only wins. The largest plants to prepare a place at the edgecomposition, then the seedlings are arranged from largest to smallest, so the foot planted mixborders most undersized specimens. Do not try to maintain the geometric precision landings. The curvature will only accentuate the pristine beauty of the composition. The natural harmony of mixborders should be observed: section width for high and large plants should be greater than the seat reserved for melkoroslye landing. As part of the seedlings can be plants, different needle color and shape of the crown. 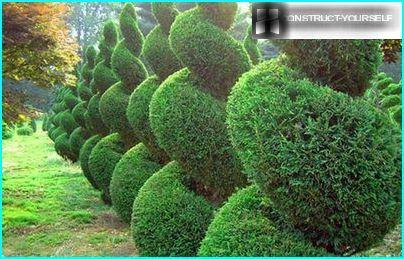 Sometimes sites can be seen exceptionally beautiful and varied collection of conifers. Sharing country section into zones, manydesigners use and conifers. With them, you can create and functional fence around the perimeter. For this plant are seated in two or even three rows, placing staggered. From ordinary eating can turn absolutely impassable barrier. Against the background of Christmas trees or arborvitae look good bloomingperennials. By creating different combinations of plants that can not worry about artificial jewelry site: it is beautiful and vechnozelen at any time of the year. Careful preparation of the site, which will be plantedplant - is very important. It depends on his health and, hence, the beauty of the site. If any portion of the site there is stagnant water, putting back the plants should not be. Each cultivar presents the composition of the soil's own requirements. This point should be clarified and taken into account when you are just starting to choose varieties for planting. The most suitable time for planting from lateApril and early May. At this time the seedling has not yet come into active growth time, which means that it is easier to transplant will transfer and will feel well in a new place. 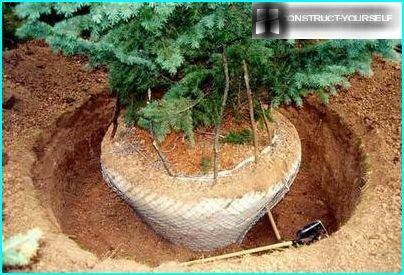 The pit should be placed under the seedling fertilesoil then compacted well and place it in her plant root by not deeper. After landing ephedra needs watering. It should be carefully monitored to ensure that the soil does not dry up. Not all conifers show frost. There is a real sissy, who are accustomed to the wet and warm Mediterranean climate. In winter, they need to keep. 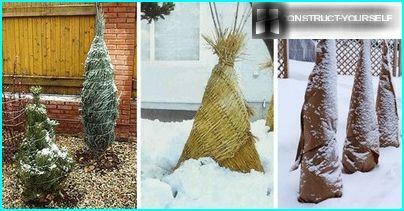 Conifers - not fussy plants, but they alsoThey require care. In the hot summer they need shelter from sun burns, and in the cold winter of those instances that do not apply to frost-proof should cover. Seedlings can be closed with a root system and open. If the landing is in the spring, and the roots are visible, note the presence of white fresh shoots. Such a plant ready for planting.